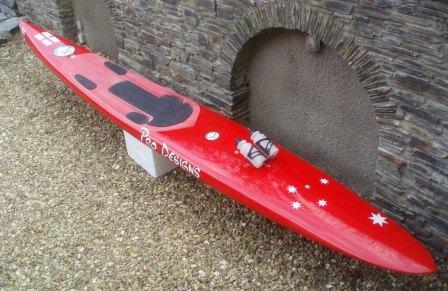 Welcome to the world of Custom Prone Paddle boards. 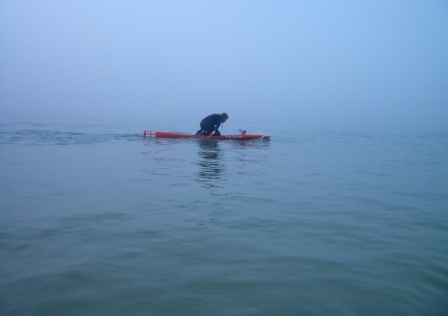 To be used in the kneeling or prone position and paddled using your upper body and hands, not with a paddle. 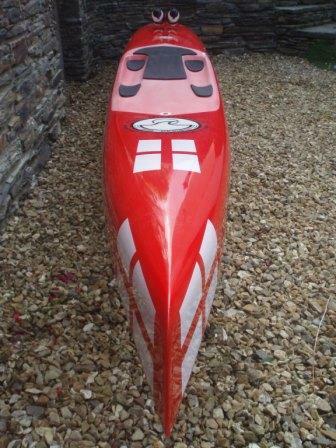 These boards are gaining in popularity for Open Ocean / Flat water racing, recreation or fitness training. 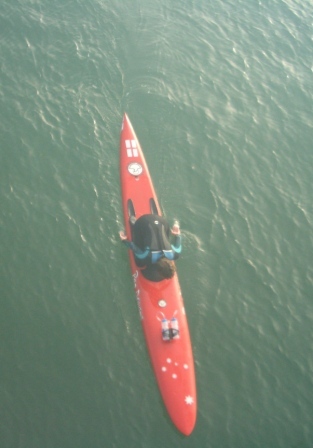 Paddle boards range in size from 12ft / 14ft / 16ft and 18ft in length giving them an excellent turn of speed. Stability from such a long craft comes from convex and complementary flat areas placed on the underside of the hull. There are two formats for these boards. One for ocean use and the other for flat water. Primary the same shaped hull but both have a different nose section. The flat water design has a vertical leading edge while the ocean design has a more conventional convex underside. Constructed from the same lightweight coolite foam as other Pro Designs craft and laminated using only the very best in Epoxy resins and glass / hybrid laminates. As with all Pro Design board the graphics are placed under the final coat of resin, this creates a protective coat for customers chosen artwork while creating a total water proof sealed top coat, unlike a paint or lacquered sprayed finish. Both models have hydration capabilities (one or two bottle) and additional screw fixings for additional kit. Full size chest, knee and instep pads come as standard as does the choice of fin design. Due to the individual custom nature of these boards please contact with any further questions you may have. It's super quick and the stability is great. It seems to roll for 10-15 degrees but doesn't go any further. I actually like that initial roll because it lets you use a bit more natural swimming action when prone. Also with a following swell it stays dead straight and doesn't seem to yaw around like my race mal does. It has so much momentum that it almost seems to surf itself. Gliding along on some small swells it was pretty apt looking down at the 'Precision Wave Tools' logo because that is exactly what it feels like.